قهاری, حسن. (1396). مطالعه‌ تنوع گونه‌ای پارازیتوئیدهای مزارع برنج شمال ایران با تأکید بر پارازیتوئیدهای کرم ساقه‌خوار برنج. فصلنامه محیط زیست جانوری, 9(4), 289-298. حسن قهاری. "مطالعه‌ تنوع گونه‌ای پارازیتوئیدهای مزارع برنج شمال ایران با تأکید بر پارازیتوئیدهای کرم ساقه‌خوار برنج". 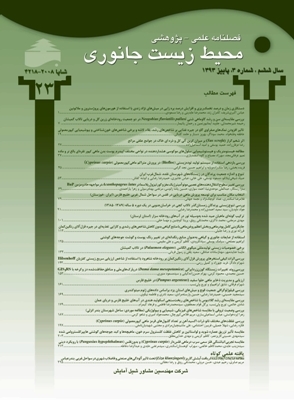 فصلنامه محیط زیست جانوری, 9, 4, 1396, 289-298. قهاری, حسن. (1396). 'مطالعه‌ تنوع گونه‌ای پارازیتوئیدهای مزارع برنج شمال ایران با تأکید بر پارازیتوئیدهای کرم ساقه‌خوار برنج', فصلنامه محیط زیست جانوری, 9(4), pp. 289-298. قهاری, حسن. مطالعه‌ تنوع گونه‌ای پارازیتوئیدهای مزارع برنج شمال ایران با تأکید بر پارازیتوئیدهای کرم ساقه‌خوار برنج. فصلنامه محیط زیست جانوری, 1396; 9(4): 289-298. پارازیتوئیدها نقش بسیار مهمی در تعادل زنجیره‌های اکوسیستم‌های طبیعی و زراعی ایفاء می‌کنند. مزارع برنج یکی از اکوسیستم‌های منحصر به فرد است که دو شرایط آبی و خشکی را به­ طور توأم دارا می‌باشد و لذا فون بسیار متنوعی از بندپایان در این اکوسیستم فعالیت دارند. در این پژوهش تنوع گونه‌ای پارازیتوئیدهای مزارع برنج در برخی مناطق استان‌های گیلان و مازندران مورد بررسی قرار گرفت. براساس نتایج این پژوهش یازده گونه پارازیتوئید از راسته‌ دوبالان (Diptera) و سی و چهار گونه پارازیتوئید از راسته‌ بال غشائیان (Hymenoptera) از مزارع برنج و مناطق اطراف آن جمع‌آوری شدند. از میان پارازیتوئیدهای جمع‌آوری شده، از راسته دوبالان (Diptera)، یک گونه از خانواده‌ Phoridae، سه گونه‌ از خانواده Sarcophagidae و چهار گونه از خانواده‌ Tachinidae، و از راسته‌ بال‌غشاییان (Hymenoptera)، سه گونه از خانواده‌ Chalcididae، هشت گونه از خانواده‌ Braconidae، بیست و یک گونه از خانواده‌ Ichneumonidae و دو گونه از خانواده‌ Trichogrammatidae شناسایی گردیدند. دو گونه زنبور شامل Coelichneumon dorsosignatus (Berthoumieu, 1894) (Ichneumonidae) و Antrocephalus mitys (Walker, 1846) (Chalcididae) گزارش‌های جدید برای فون ایران محسوب می‌گردند. ابراهیمی، ا.، 1378. مطالعه مرفولوژیک و آنزیماتیک گونه‌های جنس Trichogramma Westwood در ایران. رساله دکتری حشره‌شناسی دانشگاه تربیت مدرس. 149 صفحه. رضوانی، ن. و شاه حسینی، ج.، 1355. بررسی اکولوژی آفت ساقه خوار برنج در مازندران شرقی.نشریه مؤسسه بررسی آفات و بیماری‌های گیاهی. نشریه شماره 43، صفحات 1 تا 38. شجاعی، م.، 1377. حشره‌شناسی (اتولژی، زندگی اجتماعی، دشمنان طبیعی)، جلد سوم. انتشارات دانشگاه تهران. 550 صفحه. عمواقلی ­طبری، م. و قهاری، ح.، 1387. تأثیر کشت دوم روی انبوهی جمعیت کرم ساقه‌خوار برنج Chilo suppressalis; Lepidoptera: Crambidae. مجله علمی کشاورزی (دانشگاه شهید چمران اهواز)، جلد 31، شماره 2، صفحات 25 تا 36. قهاری، ح.؛ طبری، م.؛ استوان، ه.؛ ایمانی، س. و پروانک، ک.، 1388. گیاهان میزبان کرم ساقه‌خوار برنج Chilo suppressalis Walker (Lepidoptera: Pyralidae) و شناسایی گونه‌های Chilo spp.‌ در استان مازندران. مجله دانش نوین کشاورزی (دانشگاه آزاد اسلامی واحد میانه). جلد 5، شماره 17، صفحات 65 تا 74. Achterberg, C. van and Polaszek, A., 1996. The parasites of cereal stem borers (Lepidoptera: Cossidae, Crambidae, Noctuidae, Pyralidae) in Africa, belonging to the family Braconidae (Hymenoptera: Ichneumonoidea). Zoologische Verhandelingen. Vol. 304,pp: 1-123. Bonhof, M.L. ; Overholt, W.A. ; Van Huis, A. and Polaszek, A., 1997. Natural enemies of cereal stemborers in East Africa: A review. Insect Science Applicata.Vol. 17,No. 1, pp: 19-35. Çoruh, S.; Kolarov, J. and Çoruh, I., 2014. Probles microcephalus (Gravenhorst, 1829) a new record for the Turkish fauna (Hymenoptera: Ichneumonidae: Tersilochinae). Munis Entomology and Zoology.Vol. 9, No. 1, pp: 451-456. Dahlan, A.N. and Gordh, G., 1996. Development of Trichogramma australicum Girault (Hymenoptera: Trichogrammatidae) on Helicoverpa armigera (Hübner) eggs (Lepidoptera: Noctuidae). Australian Journal of Entomology. Vol. 35, pp: 337-344. Dwumfour,E.F. ;Owino,J.andAndere,M., 1991. Discovery capacity by parasitoids and predators of Chilo partellus eggs. ICIPE 19th Annual Report. pp: 23-24. Foerster, L.A. and Avanci, M.R.F., 1999. Egg parasitoids of Anticarsia gemmatalis Hübner (Lepidopera: Noctuidae) in soybeans. Annalsof theEntomological SocietyofBrazil. Vol. 28, pp: 545-548. Ghahari, H. and Disney, H., 2007. Megaselia scalaris (Loew) (Diptera: Phoridae) invading insect cultures in Iran. Entomologist's Monthly Magazine. Vol. 143, 164 p.
Ghahari, H.; Hayat, R.; Lavigne, R.J. and Ostovan, H., 2007. Robber flies (Diptera: Asilidae) of Iranian rice fields and surrounding grasslands. Linzer biologische Beiträge.Vol. 39, No. 2, pp: 919-928. Ghahari, H. and Tabari, M., 2008. Predator beetles (Coleoptera) and their population fluctuation in rice fields of Mazandaran. Journal of Agriculture. Vol. 10, No. 2, pp: 147-159 [in Persian with English Summary]. Ghahari, H.; Hayat, R.; Chao, C.M. and Ostovan, H., 2008a. A contribution to the dipteran parasitoids and predators in the Iranian cotton fields and surrounding grasslands. Munis Entomology and Zoology.Vol. 3, No. 2, pp: 699-706. Ghahari, H., Ostovan, H., Kamali, K. and Tabari, M., 2008b. Arthropod predators of rice fields in central parts of Mazandaran. Journal of Agricultural Sciences. Vol. 14, No. 1, pp: 63-74 [in Persian with English Summary]. Ghahari, H.; Hayat, R.; Tabari, M. and Ostovan, H., 2008c. Hover flies (Diptera: Syrphidae) from Rice fields and around grasslands of Northern Iran. Munis Entomology and Zoology. Vol. 3, No. 1, pp: 275-284. Ghahari, H.; Cherot, F.; Ostovan, H. and Sakenin, H., 2008d. Heteroptera from rice fields and surrounding grasslands of northern Iran (Insecta), with special emphasis on predator species. Journal of Entomological Research Society. Vol. 10, No. 1, pp: 13-25. Ghahari, H. and Marusik, Y.M., 2009. New data on spider fauna of Iran (Araneae). Turkish Journal of Arachnology.Vol. 2, No. 3, pp: 1-8. Ghahari, H.; Tabari, M.; Sakenin, M.; Ostovan, H. and Imani, S., 2009a. Odonata (Insecta) from northern Iran, with comments on their presence in rice fields. Munis Entomology and Zoology. Vol.4: pp: 148-154. Ghahari, H.; Ostovan, H. and Tabari, M., 2009b. Species diversity and population fluctuation of Heteroptera predators in rice fields of Mazandaran province, northern Iran. Journal of Plant Protection.Vol. 1, No. 1, pp: 27-41 in Persian, English summary. Ghahari, H.; Fischer, M.; Çetin Erdoğan, Ö.; Tabari, M.; Ostovan, H. and Beyarslan, A., 2009c. A contribution to Braconidae (Hymenoptera) from rice fields and surrounding grasslands of northern Iran. Munis Entomology and Zoology.Vol. 4, pp: 432-435. Ghahari, H.; Collingwood, C.A. ; Tabari, M. and Ostovan, H., 2009d. Faunistic notes on Formicidae (Insecta: Hymenoptera) of rice fields and surrounding grasslands of northern Iran. Munis Entomology and Zoology.Vol.4, No. 1, pp: 184-189. Ghahari, H.; Jedryczkowski, W.B. ; Kesdek, M.; Ostovan, H. and Tabari, M., 2009e. Ground beetles (Coleoptera: Carabidae) from rice fields and surrounding grasslands of Northern Iran. Journal of Biological Control.Vol. 23, No. 2, pp: 105-109. Ghahari, H.; Anlas, S.; Sakenin, H.; Ostovan, H. and Tabari, M., 2009f. A contribution to the rove beetles (Coleoptera: Staphylinoidea: Staphylinidae) of Iranian rice fields and surrounding grasslands. Linzer biologische Beiträge. Vol. 41/2, pp: 1959-1968. Ghahari, H.; Satar, A.; Anderle, F.; Tabari, M.; Havaskary, M. and Ostovan, H., 2010. Lacewings (Insecta: Neuroptera) of Iranian rice fields and surrounding grasslands. Munis Entomology and Zoology.Vol. 5, No. 1, pp: 65-72. Ghahari, H.; Sakenin, H.; Ostovan, H. and Tabari, M., 2015. A study of Coleoptera (Insecta) from the rice fields and surrounding grasslands of northern Iran. Entomofauna.Vol. 36, pp: 529-536. Godfray, H.C.J., 1994. Parasitoids, behavioral and evolutionary ecology. Princeton University Press. 473 p.
Grenier, S.; Greany, P. and Cohen, A.C., 1994. Potential for mass release of insect parasitoids and predators through development of artificial culture techniques. In: Pest management in the subtropics: Biological control a Florida perspective, Rosen, D., Bennett, F.D. and Capinera, J.L. (eds). Intercept Publication. Chap. 10, pp: 181-205. Huffaker, C.B. and Messengaer, P.S., 1976. Theory and practice of biological control. Academic Press, 745 pp. Humala, A. and Reshchinkov, A., 2014. Ichneumonidae (Hymenoptera) species new to the fauna of Norway. Biodiversity Data Journal. Vol. 2, pp: 1-26. Kalyebi, A.; Sithanantham, S.; Overholt, W.A. ; Hassan, S.A. and Mueke, J.M., 2005. Parasitism, longevity and progeny production of 6 indigenous Kenyan trichogrammatid egg parasitoids (Hymenoptera: Trichogrammatidae) at different temperature and relative humidity regimes. Biocontrol Science and Technology.Vol. 15, No. 3, pp: 255-270. Kfir, R.; Overholt, W.A. ; Khan, Z. and Polaszek, A., 2002. Biology and management of economically important Lepidopteran cereal stem borers in Africa. Annual Review of Entomology.Vol. 47, pp: 701-31. Kogan, M., 1998. Integrated pest management: historical perspectives and contemporary developments. Annual Review of Entomology.Vol. 43, pp: 243-270. Li, Li.Y., 1994. Worldwide use of Trichogramma for biological control on different crops: A survey. pp. 37-53. In: Wajnberg, E. and Hassan, S.A. (eds), Biological control with egg parasitoids. C.A.B. International, xiv. 286 p.
Mochia, M.B. ; Ngi Song, A.J. ; Overholt, W.A. and Stouthamer, R., 2002. Variation in encapsulation sensitivity of Cotesia sesamiae biotypes to Busseola fusca. Entomological Experimentalis Applicata.Vol. 105, pp: 111-118. Mohyuddin, A.I., 1990. Biological control of Chilo spp. in maize, sorghum and millet. Insect Science Applicata.Vol. 11, No. 4/5, pp: 721-732. Omwega C.O. ; Kimani S.W. ; Overholt W.A and Ogol, C.K.P.O., 1995. Evidence of the establishment of Cotesia flavipes (Hymenoptera: Bracondiae) in continental Africa. Bulletin Entomological Research. Vol.85, pp: 525-530. Overholt, W.A., 1998. Biological control. In: Polaszek, A. (ed. ), African cereal stem borers: Economic importance, taxonomy, natural enemies and control. Wallingford, UK: CABI. 530 p.
Overholt, W.A. ; Ngi Song, A.J. ; Kimani, S.K. ; Mbapila, J.; Lammers, P. and Kioko, E., 1994. Ecological consideration of the introductions of Cotesia flavipes Cameron (Hym. : Braconidae) for biological control of Chilo partellus (Swinhoe) (Lep. : Pyralidae) in Africa. Biocontrol News Inf.Vol. 15, pp: 19-24. Overholt, W.A. ; Conlog, D.E. ; Kfir, R.; Schulthess, F. and Setamou, M., 2003. Biological control of gramineous Lepidopteran stemborers in sub-Saharan Africa, pp. 131-144. In: Neuenschwander, P., Borgemeiser, C. and Langewald, J. (eds), Biological control in IPM system in Africa. CAB International. 448 p.
Parra, J.R.P. and Zucchi, R.A., 2004. Trichogramma in Brazil: Feasibility of Use after Twenty Years of Research. Neotropical Entomology. Vol. 33, No. 3, pp: 271-281. Pinto, J.D. 1999. Systematics of the North American species of Trichogramma Westwood (Hymenoptera: Trichogrammatidae). Memoirs Entomological Society of Washington. Vol. 22, pp: 1-287. Polaszek, A., 1995. Cereal stem borers in Africa: taxonomy and natural enemies. Handbooks for training course held at ICIPE Nairobi. pp: 15-28. Polaszek, A., 1998. African cereal stem borers: Economic importance, taxonomy, natural enemies and control. Wallingford, UK: CABI. 530 p.
Potting, R.P.J. ; Overholt, W.A. ; Danso, F.O. Takasu, K., 1997. Foraging behaviour and life history of the stemborer parasitoid Cotesia flavipes (Hymenoptera: Braconidae). Journal of Insect Behaviour.Vol. 10, pp: 13-29. Tumrasvin, W.; Sucharit S. and Vutikes, S., 1997. Studies on the life history of Megaselia scalaris (Loew) in Thailand. Southeast Asian J. Trop. Med. Public Health.Vol. 8, pp: 74-76. Wajnberg, E. and Hassan, S.A., 1994. Biological control with egg parasitoids. CAB International. 286 p.
Zhou, G.; Overholt, W.A. and Kimani-Njogu, S.W., 2003. Species richness and parasitism in an assemblage of parasitoids attacking maize stemborers in coastal Kenya. Ecological Entomology.Vol. 28, pp: 109-118. Zucchi, R.A. and Monteiro, R.C., 1997. O gênero Trichogramma na América do Sul, pp. 41-66. In: Parra, J.R.P. & Zucchi, R.A. (eds. ), Trichogramma e o controle biológico aplicado. Piracicaba, FEALQ. 324 p.